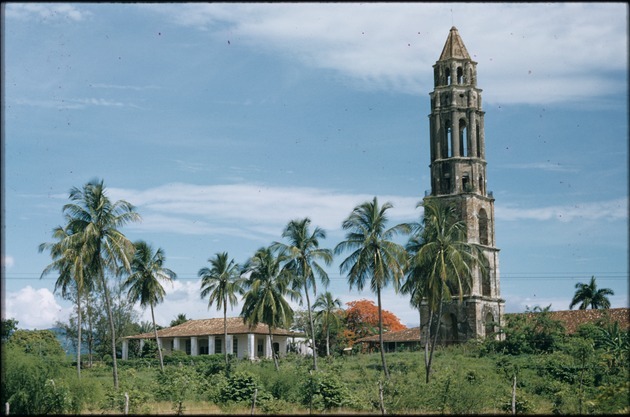 The Manacas Iznaga Tower is located in Valle de los Ingenios in Trinidad, Cuba, which was a major center for sugar mills. The tower stands approximately 45 feet tall and was used by the sugarcane plantation owner in order to keep watch over his slaves in the fields. It was built in 1816 and stands seven stories high. The ringing of the bell signified various messages, but mostly the beginning and end of the work day for the slaves in the sugar fields. A local legend states that the tower was built by Pedro and Alejo Iznaga to house Alejo's wife, who had been unfaithful to him. The photograph also shows the remains of the Iznaga plantation, as well as several Royal Palm trees and a Poinciana tree in the background.